Buy Zimbra Talk licensing this December and save 25% ! For the next month, Zimbra licensing has a fantastic savings opportunity. Purchase Zimbra Talk from XMission by the end of the December 2016 and save 25%! 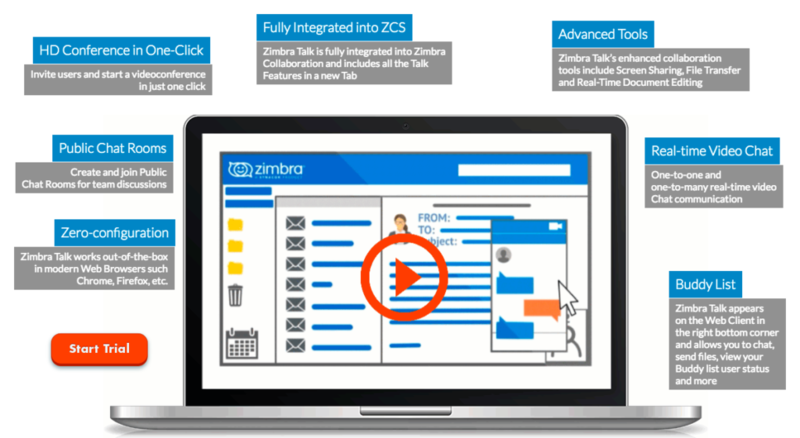 Zimbra Talk allows your Zimbra server (Network Edition) to host live chats, video conferences, audio conversations, group document editing, plus file and screen sharing all from your Zimbra webmail. You can even use external xmpp chat applications on mobile and desktop to communicate with your team in real time with Zimbra Talk. Don’t have Network Edition Zimbra Collaboration? No problem, XMission provides healthy discounts on new purchases when combined with Zimbra Talk. Lean more about Zimbra Talk v 2.3 by attending the December 1st, 2016, webinar. Click here to sign up for the webinar. Save $328 when purchasing perpetual licensing of 25 Zimbra Talk mailboxes with Premier support for one year! Note: Zimbra Talk support level must match your Network Edition support level. Zimbra Talk is sold in increments of 25 and you may purchase as many increments as you need. It can be the same or fewer than your Network Edition license mailbox count. Package pricing reflects Tier 1 discounts on purchases from 25 to 249 mailboxes. Need help understanding the Zimbra licensing? Simply contact John at 801-303-0805 or john@xmission, and read our licensing wiki page. Zimbra offers government and non-profit organizations additional discounts. spam filter and virus blocking with added emergency mail spooling for free. No obligation. Remember: This licensing promotion expires December 29th!